A lot of stamping, embossing, cutting, tearing, cropping, curling, coloring and pasting.... I love the turquoise-green with the orange! This was fun to make and a great way to experiment with different techniques. My FAVORITE cartoon from growing up is Scooby-Doo - my kids are all Scooby fans also. As such I am happy to be sharing information about a new sweepstakes where you can possibly win a home entertainment system worth $1,000 and Blu-ray™ DVDs of the first Scooby-Doo! musical (available in stores on March 13, 2012). The animated feature follows the cartoon gang of Scooby, Shaggy, Daphne, Fred and Velma as they attend a vampire festival and mayhem ensues. Those meddlin' kids! I am also hosting a giveaway. 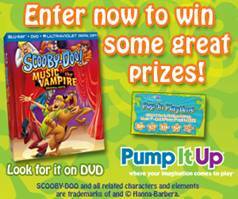 Here you have the chance to win a free Blu-ray DVD of Scooby-Doo! Music of the Vampire. Simply fill out the Rafflecopter form below! Disclosure: I occasionally receive compensation in the form of gift cards and products for posts, typically for review purposes. However, the opinions I share are solely my own.